The high winds and huge waves that snarled traffic during rush hour Friday afternoon began to recede by Friday night. 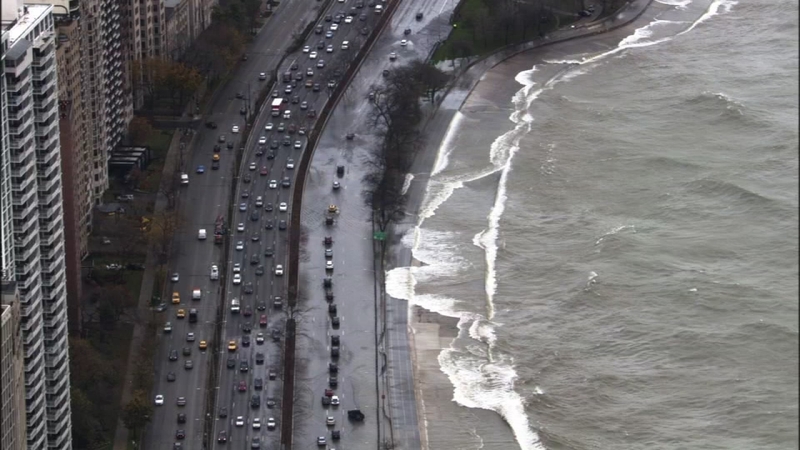 CHICAGO (WLS) -- Strong, cold winds have continued to produce high waves along the city's lakefront - though they have receded since they snarled traffic during rush hour Friday afternoon. Cars moved slowly through the area from North Avenue to Division street on Lake Shore Drive Friday as waves from Lake Michigan led to lane closures. Cars were in a single-file line as waves crashed around the three lanes closest to the water. Emergency crews and trucks blocked the lanes to traffic while they worked to remove water off the road, city officials said. At one point, waves did reach the southbound side, causing traffic in both directions to stop. It was a magnificent sight, and some people risked getting splashed just to see it. "It's ridiculous," said Dan Reid, who came to watch the waves. "I came out here to take some pictures with my dog, we almost got destroyed and sucked out to sea but, uh, it's fun." The intense wind and waves also caused a barge to sink at Navy Pier, and toppled trees and caused damage in north suburbs and Northwest Indiana. 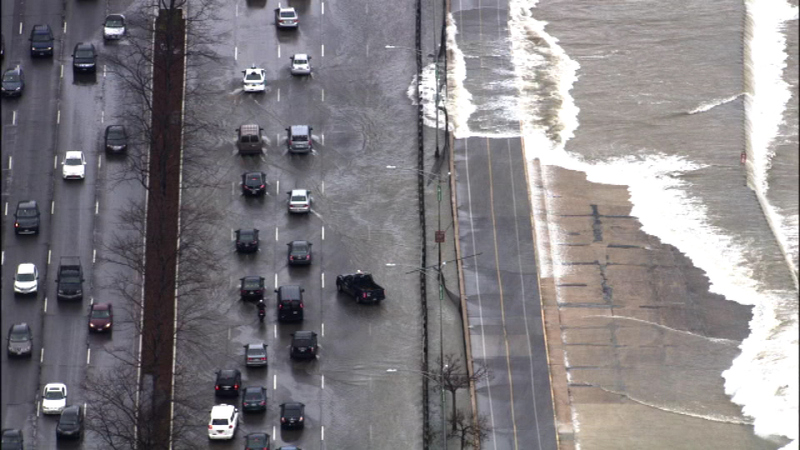 Watch high waves from Lake Michigan cause flooding in the northbound lanes of Lake Shore Drive between North Ave and Division St.
ABC 7 Eyewitness News reporter Terrell Brown reports that it took two hours to travel from Randolph to Lawrence on northbound Lake Shore Drive. "When you're coming down past Belmont, where you can actually see the waves crashing above the line where you're not supposed to even see the lake - and all you see is waves crashing, it's very scary," said Alexia Spizzirri, a driver. "Giant waves, the police cars and everything, so we had to pull over and see first-hand," said Chris Carlson, a driver. "It's awesome." High waves from Lake Michigan led to lane closures along Chicago's Lake Shore Drive from North Avenue to Division Street.